I found some new favorites in Curls to GO! So...I've been sitting on a gold mine. About a month or so ago, you saw me and a ton of other bloggers fawn over Jane Carter Solution's new Curls to GO! care package - with jars and bottles of pretty pink products, fun accessories, and even a Hot Head Thermal Conditioning Cap. While everyone marveled at the newness and heavenly fragrance, I knew it was my duty to answer that one question - but does it work tho? So let's get to answering it. You know how I do - we're going to run through each product one-by-one, so you can make the best informed decision about how to spend your coins! In this post, we're going to break down the Curls to GO! Curl Drench Cleansing Co-Wash, Untangle Me Weightless Leave-In, and Curl Cocktail Conditioning Styling Cream. In the next post, I'll cover the Coiling All Curls Elongating Gel, Shine On Curl Elixir, and Mist Me Over Curl Hydrator. While you're getting all the finer details about each product, check out my demo using the entire Curls to GO! collection! No. Curl Drench contains amodimethicone, which becomes water soluble (yes, a water soluble cone!) when accompanied by cetrimonium chloride and trideceth-12. In this case, amodimethicone is not water soluble (no trideceth-12 in the formula). .Although not water-soluble, amodimethicone is a deep conditioning silicone that targets the most damaged areas of the hair while resisting build-up. Okay listen. You guys know I fell hard and fast in love with the Healthy Hair Cleansing & Conditioning Co-Wash. I thought that was the pinnacle of co-wash achievement for Jane Carter Solution. I was wrong. 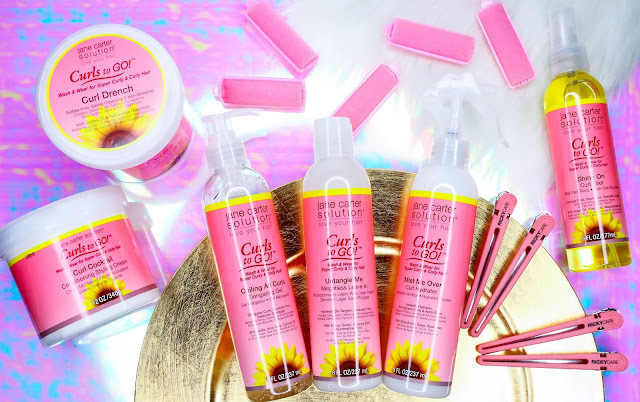 Curl Drench is #newcowashbae because like...it's everything. Slippier than it's Healthy Hair predecessor. Glides with even more ease over tangles, knots, and the rough ends of my hair (hi color damage). The fragrance is passionfruity-floral with a hint of pink starburst. It comes on a bit strong, but doesn't linger at all. It makes my hair feel soft, shiny, and smooth. While removing gobs and gunks of old product buildup. When I filmed my video demo for the Curls to GO! line, it dawned on me that there was no rinse out or deep conditioner. Then I read the label: Use Curl Drench in place of shampoo and conditioner to reduce dryness, remove product build , cleanse, condition, and rehydrate your curls. OH! So we're cleaning and conditioning with one product now? That's what we gon' do? Well aiight then. As it turns out, Curl Drench hit the nail right on the head - I skipped deep conditioning and didn't look back. Given that this is #BlacknCurlyFebruary and all, I was shocked to learn (after using Curl Drench 3 different times) that it's not silicone free. This might be the first Jane Carter Solution product with a silicone in it. I ain't mad, and it ain't bad - I just wasn't expecting it. Nonetheless, the only complaint I have is, where's my flip-top lid Jane? We had a good thing going, now it's just...gone. Sigh. If you're short on time, got crazy tangles, or battling aginst dryness on wash day, then Curl Drench is a must. I've fallen in love with Curl Drench something serious. Although I love the idea of using less products, I can't jive long-term with not deep conditioning. So I do it anyways - and just love Curl Drench all the same. It works great by itself, and with other products. Trick question! I didn't buy this one. But you better believe I'm stalking Sally's, Target, and anywhere else necessary to find Curl Drench on the ground. And don't be surprised if you see this pink jar at the end of 2017 in the Christina's Choice roundup. Just saying. Fully dry wash and go results. More details in part 2! WHERE HAVE YOU BEEN ALL MY LIFE?! No, like seriously. Easily one of my favorites in the Curls to GO! collection. It smells amazing, has ridiculous slip, and reminds me of a slightly thinner version of Eden BodyWorks Coconut Shea Leave-In (that I love so much). I didn't have to use 3/4 of the bottle in one run - it definitely lasts. In my book, the Untangle Me Weightless Leave-In is virtually flawless. Rather than virtually flawless, let's go with plain ol' flawless. I've got nothing. WHEN CAN I FIND THIS IN STORES, JANE?! Coconut Oil: Oil high in saturated fats (which is why when cold, it is solid). One of the few known oils to penetrate the hair shaft and truly moisturize hair. Coconut oil helps to moisturize, seal, and prevent breakage. Safflower Seed Oil: Oil naturally rich in Vitamin E, which delivers antioxidant and regenerative properties to the hair and scalp. Also has been known to improve blood circulation and stimulate hair growth. Shea Butter: Emollient fat from the nut of the East or West African shea nut tree used to soften hair and skin, and aid in moisture retention. Argan Oil: Oil rich in vitamin E and contains omega 3 and omega 9 fatty acids that provide nutrition for hair. It also contains Linoleic and oleic acid that helps to hydrate and moisturize hair. Helps repair damaged follicles, imparts shine, and prevents frizz and rough ends. Aloe Vera Juice: Acts as a natural conditioning agent that restores the hair's sheen, luster, and shine. It not only makes the hair soft, but it also enhances strength and suppleness. The curly care package they sent was soooo cute! Curl Cocktail accomplishes something that I absolutely love in a product - thick, creamy, rich, and super moisturizing without being greasy. That right there is enough alone. But Curl Cocktail goes beyond that - it's easily the most versatile product in the lineup. You can use it as a leave-in, pair it with Untangle Me (the two pair beautifully), pair it with Untangle Me and Coiling All Curls - or just use Curl Cocktail as a styler all on its own. It can even be used as a re-moisturizer for hair between wash days. It goes on super easily, has nice slip, and makes the hair feel super smooth and lush. Another bonus? A little goes a long way, so that 12oz jar will definitely last! Don't judge me here - but I've got nothing. Call me biased, but I love Curl Cocktail. If you're looking at the Curls to GO! Line like, "Ok Christina, I ain't got time to buy fifty-leven products. Which ones should I actually get?" Let me tell you sis - if you gotta only pick ONE? Make it Curl Cocktail. Trussssst me. I'm just waiting on Jane to get back to me about when I can see this in Target! Are you seeing any products from the Curls to GO! collection that you're like ummmm MUST TRY?! Let me know in the comments below! 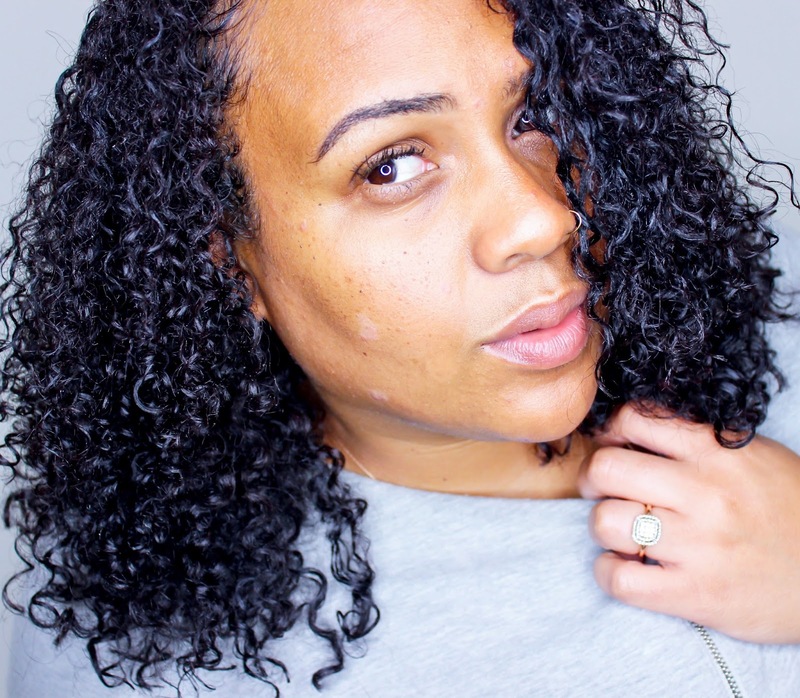 Click here to read Part 2 with the Mist Me Over Curl Hydrator, Shine On Curl Elixir, amd Coiling All Curls Elongating Gel! Per the FTC, I have to let y'all know that this post is sponsored by Jane Carter Solution. But that doesn't mean anything - I'm still keeping it 100 and giving you guys the real. Yes, thank you! These are the exact 3 products I want to try from this line. Im waiting for Sallys to stock them! Very good article and I like it.There are exact 2 products I want to try from this line.I have never try this before.Thank you so much for sharing me! Do the co-wash and the leave-in have coconut oil in it? If so, where on the ingredient list are they? I can't find the list of ingredients anywhere! My hair does not like coconut oil at all, unfortunately. Curly hair is so beautiful. My hair has always been straight but I really want to have that natural curl most women have nowadays. I just think that the straight hair is too common, the curly one on the other hand is very unique and provides a sense of individuality to a person. I tried to curl my hair once but it ended up look so forced and unnatural. Do you know any treatment that I can do to have that same hair as yours? If you do then it will be very nice.